Running traces. Jenny Xie grabbed the information from the app RunKeeper and made these beautiful maps of 22 major cities in the U.S. Here's ;R code snippet in case you want to map your own routes. 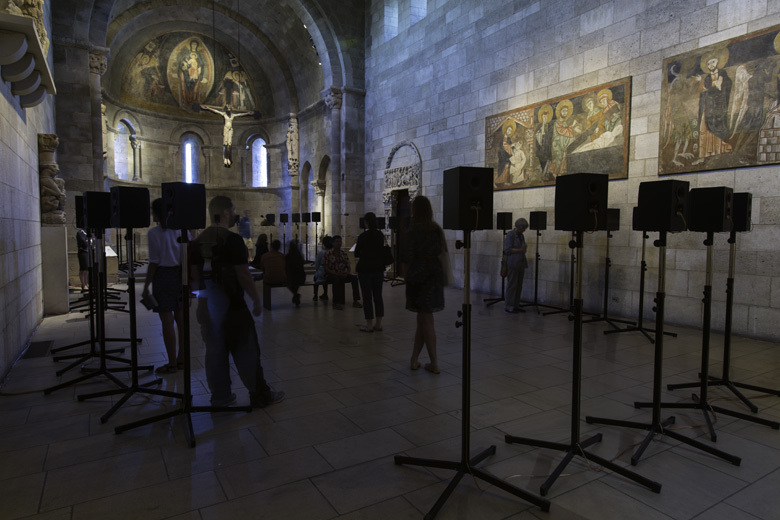 Just Beautiful "The Forty Part Motet (2001), a sound installation by Janet Cardiff (Canadian, born 1957), will be the first presentation of contemporary art at The Cloisters. Regarded as the artist's masterwork, and consisting of forty high-fidelity speakers positioned on stands in a large oval configuration throughout the Fuentidueña Chapel, the fourteen-minute work, with a three-minute spoken interlude, will continuously play an eleven-minute reworking of the forty-part motet Spem in alium numquam habui (1556?/1573?) by Tudor composer Thomas Tallis (ca. 1505–1585)." "Taking Measures" in person at the Gardner Museum opening June 27th. This is a very needed item in my house on the bedside table. Of course, I would prefer a white book. I Love this. In this day and age of never ending cords for our multiple gadgets and their myriad functions, it’s nice to see a charger camouflaged in an old book. Yes, for true (sentimental) bibliophiles, it hurts a tiny bit to know that a book has been put out to pasture, but it’s certainly a relief to know it’s not been chucked into some landfill, and it’s doing a different job altogether. The book acts as housing for a charger (it’s a solid unit), and means there’s no losing the cord behind your nightstand or desk. Designed to be compatible with iPods and iPhones (iPod/nano/touch, iPhone 3G, 3GS & iPhone 4G), accommodates sync and charge functions via a USB cable, wall connector is not included. inbook Charging Stations — ACCESSORIES -- Better Living Through Design. I need one of these. Polargraph | drawing by robot. All Things about this are just wonderful. Take a look see. The Alphabet 2- a horn book video experiment - is a developmental spelling - video where each character visually represents the meaning of the word itself. Playing with different techniques and materials into little and big spaces, but always focusing on Helvetica font's proportions. A collection of words in a delightful spelling-video. n9ve web site n9ve.itThe Alphabet 2 from n9ve on Vimeo. A commercial that put tears in my eyes, really, and it's for Chipotle for gods sake. A new stop motion ad for Mexican food chain Chipotle by London-based Johnny Kelly, set to a Willie Nelson cover of the Coldplay song, The Scientist. The video features the story of a farmer seduced by profits into large-scale unsustainable and unhealthy farming practices who decides to go “back to the start”, ridding the farm of its factory machinery resulting in happier and healthier animals. The quality of the animation is simply incredible and I was left wondering how on Earth they had accomplished some of the shots. Luckily the production team at Clapham Road Studios was a step ahead of me and shot a making-of clip that shows the enormous table containing the farm and hundreds of components used to make it move. Epic “Back to the Start” Stop-Motion Ad for Chipotle (Plus Bonus Making-Of Goodness) | Colossal. I happened upon this bird nest yesterday and thought it wouldbe nice to share. armelle caron - images - tout bien rangé. I'm quite fussy about jewelry, but I find most Amy's work quite astonishing. I wish my ears were not spent so I could wear some of her amazing earrings. It got me to pledge. Plus I want one for hot yoga. Taking flooding into their own hands. I find these images fascinating. Sometimes the fog can be beauty. This was shot as I was driving to NYC.